There are so many benefits to choosing GRP fibreglass sheets over other security glazing products such as wired glass. For a start choosing GRP sheets ensures that your building or wall has security & anti-vandal glazing that can withstand even wilful violence. The GRP glazing sheets product range has been tested to the highest levels of impact and now carries the BS Kitemark to prove its durability. This particular form of anti-vandal glazing is also incredibly versatile and comes in as many different sizes, colours and depths as you can imagine. It also has a range of meshes overlaid onto the sheet so that you can create the finish you need to protect your property. 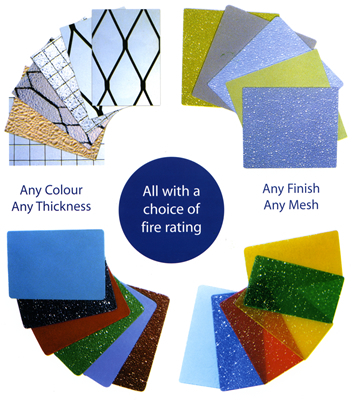 Our range of GRP sheets & security glazing has also been designed to meet various levels of fire ratings as laid out by the Building Regulations, 1976. This means that our four types of anti-vandal glazing can deliver safety and reliability no matter where it is installed when the right type of GRP fibreglass sheets are used for the right application. We have different styles of reinforcing mesh available giving your security glazing extra strength as well as more choice of the visual appearance your finished product has. With choices of Gothic, Tudor, Diamond Mesh and Clear your anti-vandal glazing product will be an effective defence as well as enhancing the look of the property that the GRP fibreglass sheet is applied to. Once you have chosen which GRP sheet product is best for your structure you can rest assured that you have protection from vandalism and thus further maintenance. If you are unsure which glazing product is best suited to your building contact our customer care team for further advice today. What are GRP Fibreglass Sheets? GRP Fibreglass sheets are one of the most widely used materials for anti-vandal glazing, balcony panels, infill panels curtain walling, hygenic lining, soffit panels and kick plates. Impact resistant, it will withstand accidental and willful violence. Reduced replacement costs, fewer replacements means lower maintenance costs. Blends aesthetically with it's surroundings. Good light transmission properties, saves artificial lighting. Simple to install, reduces on site costs. Safe from corrosion, UV stabilised. Resistant to extreame temperatures, 5 year guarantee. Maintenance free and visually attactive. Unlike wired glass, Vandalite products may be handled and fixed with relative ease, reducing on-site fixing costs. Cutting on site or at customers' premises is possible using appropriate equipment. We recommend guillotine, abrasive wheel or jigsaw, according to the version chosen. Our fast curing security glazing mastic gives a guaranteed fixing of Vandalite to timber, steel, aluminium, UPVC and even concrete or brick rebates. Vandalite glazing products have satisfied the most rigorous testing. The British Standards Institution BS5544 (1978) impact resistance test, for example, involved a hardened steel ball of 2206g mass being dropped from heights of up to 9 metres onto samples of Vandalite. Each remained intact throughout. As a result, Vandalite was the first glazing product in the world to carry the BS Kitemark for Anti-Bandit Glazing. Rigorous testing of Vandalite to surface spread of flame, fire resistance and fire exposure criteria of B.S.I, has also been effected across the product range. As the cost of vandalism to property continues to rise year after year, in rural as well as inner city areas, it is now necessary to consider the material specification on 'at-risk' structures in order to counter the effectiveness of the vandal. The most familiar, and costly, act of vandalism is the breaking of glass. Often this is simply wilful damage. However, it can also be the easiest entry point to a building. Vandalism can, therefore, be extremely costly: once a vandal gains access to a building, consequential costs can escalate dramatically. The effects of vandalism are well documented. However, architects and users can now counter this problem with a choice of materials specifically designed for vandal resistance and freedom from maintenance. Vandalite Security Glazing was designed with the problem of vandalism very much in mind, everything from street lighting to bus shelters, factories to void housing. The product itself was designed to provide a viable alternative to conventional 'Georgian Wired' type products, which are costly to maintain and increasingly difficult to install. Although all Vandalite glazing is designed to be economical in use, no compromise on quality or performance is ever considered. Standard Vandalite is probably the most durable glazing material available today. Unlike glass, it won't shatter, because the resin based translucent sheet is reinforced by a flattened expanded steel diamond mesh. Available in three thicknesses and a selection of stock sizes (see specification panel), Georgian Vandalite has the appearance of wired glass but with the benefits of Vandalite. Georgian Vandalite is available with an optional 'cracked ice embossed' surface finish on one or both surfaces of the sheet. Available in two fire ratings, the most popular being 85476 part 7: class 2. This product is typically used in glass roof structures, infil panels and glazed doors. The recent addition of the 'Gothic' reinforcing mesh has once again provided the specifier with more choice in the visual appearance of the product. The striking design ensures that the strength of the sheet is unaffected whilst aesthetics are enhanced. The product is available in two thicknesses and two fire ratings. Gothic is not a stock item and is available on high volume orders only. Offering the same qualities as Standard Vandalite, but with a more open mesh design, Tudor Vandalite allows improved levels of light transmission. This product is available in 3mm nominal thickness and in sheet size 1220mm LWM X 2440 SWM. Tudor is not a stock item and is available on high volume orders only. Offering the same qualities as Standard Vandalite, Clear Vandalite allows improved levels of light transmission. As well as a number of surface finishes ranging from smooth to 'cracked ice' (single or both sides), the product can also be supplied in an opaque or translucent form in a range of 854800 and RAL colours. Decorative Vandalite does not compromise any of the product's security or vandal resistant qualities and enables the product to be used in a host of building roles, including infill panels in bus shelters, balconies, schools and toilets. The vandal resistant qualities of the material make graffiti removal simple - without spoiling the sheet surface! The four types of Vandalite available are variously designed to meet the many different 'fire ratings' required by the Building Regulations, 1976.These include the following British Standards: External: SAA (BS476 Part III) Class II: (BS476 Part V11) Class I: (BS476) Part V11) '0' Rating: (Building Regulations 1976) Fire Grades are designed and quoted for in good faith and with the experience of our resin suppliers and ourselves in manufacturing sheet to meet these standards. In all cases the resins used are stated by manufacturers to be the appropriate class and tested to that standard in a representative range of laminates. Vandalite do not warrant that any laminate will confirm to specific parts of BS476 or any other fire test. Possibly the ultimate reinforced glazing material for use in fire doors and similar applications.This product has been independently tested and found to achieve over two hours' Integrity in BS476 part 22: 1987, indicative tests. During such tests the material was subject to temperatures of up to 1030°C on the furnace side and 300°C on the unexposed side. All Vandalite types are available with 'cracked ice' embossed surface finish (single or both sides), opaque or translucent and can be supplied coloured in any BS4800 specification tint. Depth of colour will vary according to thickness. As tinted Vandalite is manufactured against specific orders a sample of colour should be supplied for matching.The colours shown here are a selection and as close as the printing process will allow. All Vandalite types meet the impact resistance requirements of BS 5544:1978. Accelerated weathering tests have been performed on all Vandalite types to correspond with 8 years of natural weathering. Negligible degradation occurs over this period. Our sales staff will be happy to discuss your security glazing problems. We have our own representation throughout the United Kingdom. Simply ring Vandalite's Sales Department on (01254) 383333 or 01254 357000. Vandalite offer a swift and efficient delivery service to all parts of the UK and Eire. For further details ask our Sales Department -(01254) 383333 or 01254 357000. All Vandalite types have thermal conductivity figures lower than glass. Heat losses can therefore be expected to be very much lower with single glazed panels. All Vandalite types should be fixed as per diagram and can be fixed to the following substrates: timber, brick, concrete, stone, steel, pvc and aluminium. Always use Vandalite Fast Curing Security Glazing Mastic when fixing all Vandalite types. 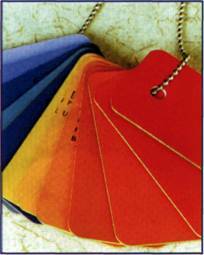 Store sheets flat with suitable spacers between each sheet. Strip off protective film before fixing. A cutting service is available for non-stock size requirements. Any additional charge will be quoted at time of ordering. In all cases nominal thicknesses are designated by type, eg TYPE 3 - 3mm nominal thickness. Contact Us now to find out more about our Fibreglass GRP Sheets & Vandalite Security/Anti Vandal Glazing.